This is an open letter with regards schools and their libraries or lack of. While I totally applaud your decision to do away with National Standards, I beg you to consider another factor which troubles schools, particularly primary schools. A recent announcement that our literacy levels have dropped to 32nd place is deeply concerning. While teachers do all they can to teach reading and basic comprehension, and do it well, they need support from librarians and of course parents too. Students need to be surrounded by books, quality books and the latest new titles. Sadly, because libraries and library staff are not funded by the MOE many school BOT’s are forced to choose between funding a full-time librarian and school resources. This should not be a choice. Schools need a library and a dedicated and enthusiastic full-time librarian. Librarians know their students and their stock and most are very good at matching each to the other. To be fair, some schools choose not to have libraries based on their own priorities but for those who have no choice based on the funding from government, then this is incredibly sad. Not all parents take their children to a public library, some are too busy, it’s too far or they don’t see it as necessary. And yes, parents do need to be part of their children’s reading development but sadly, we know the reality. Overseas trends where school libraries have closed have seen a drop in literacy levels and the same is happening here in New Zealand. For those skeptics that say books are the past and it is all about a digital world, a gentle reminder that libraries are not just about books. So much happens in libraries these days, books, ebooks, computers, ipads, QR codes, makerspace activities, book clubs, author events, a safe haven for students and of course reading, heaps and heaps of reading. Here is the crunch though, schools without funding, without libraries and librarians will surely only add to the the dropping literacy levels. I urge you and your members to consider that in order to raise reading levels, the New Zealand Government must help fund school libraries and their librarians. It is only ever going to be a win-win situation. Statistics also have shown that students who have a full time librarian produce better overall results than students who don’t. Left to their own, without government funding, some schools will end up closing their library doors and that is totally unacceptable. Raising funds for their libraries, school PTA’s can sell only so many sausages. The same selling of sausages has to help top up readers. The Ready-to-Reads and School Journals are a wonderful, first-class resource but children need far more titles than is supplied. Immersion in books, both readers and library books is paramount. A few tatty teacher-owned books in the corner of a class is one thing but a library with thousands of books and a passionate librarian completely another. How does a six year old with a reading age of ten cope with a few books in a classroom? Or the ten year old reading at a six year old level. Is he or she supposed to go to a junior class in the hope a teacher will have something they can read? A good school librarian will know exactly which book will work. They will find the book with content that matches their chronological age with their reading age so they are not put off reading with books with babyish covers. As the old adage goes the right book for the right child. I love watching students clamor for the latest Diary of a Wimpy kid, or David Walliams latest title. Watching groups eager to share their latest read with each other is also simply a wonderful sight. It is this that will drive up literacy levels. A love of reading comes from finding the right books and that is where a well-stocked library and librarian can help. So, I urge you Prime Minister to look at how schools fund their libraries and please consider helping with MOE funding as every child will benefit. Schools need your help. Students need your help. Reading is the key to everything we do in life, from a simple menu, to technical instructions, we all need to read and it starts when children are young. Please help our kids for their future. Lets drive the literacy levels back up and let’s do this together. Thoroughly enjoyable read. A wonderful mix of fantasy, and mystery. Lots of very likable characters and some not so likable ones too. We meet young Morrigan Crow shortly before she is supposed to die. Morrigan you see, is cursed and blamed for all the bad things that have happened in her town. Her fate is to die at midnight on Eventide. However, in comes a stranger by the name of Jupiter North who rescues her and takes her to Nevermoor. It is a place few have heard of with all sorts of magical creatures and wonderful characters. Jupiter North has plans for Morrigan, plans she doesn’t understand but there is something special about him that makes Morrigan trust him. So begins her new life in the Hotel Deucalion in Nevermoor. Morrigan is compelled to particpate in a number of trials in order to become part of a very elite group called the Wondrous Society. Each contestant must have a knack, something that makes them special and will help them in the final trial. In the trials she must compete against 500 others for one of only 9 places. 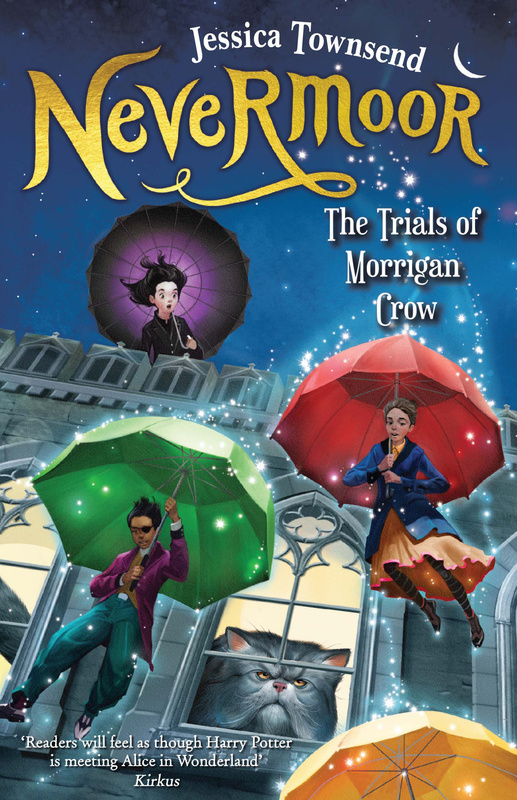 Making the group will allow her to stay in Nevermoor where she is finally making friends and beginning to feel happy. Morrigan is both strong, yet fearful, funny, yet serious. Most of all she is in need of friends and the belief that someone loves her and believes in her. There are so many wonderful, quirky characters in this book, not least of all is Fenestra the Magnificat, head of housekeeping, who despite her grumpiness is really kind of cool. There’s Frank the vampire dwarf but whatever you do, don’t call him a dwarf vampire. Jessica Townsend has created a delightful magical world, with believable fantastical characters and a mystery that needs solving. Just what is Morrigan’s knack? Morrigan herself, doesn’t even know and the only person who seems to know is Jupiter North and he won’t tell her. A great read and hanging out now for book two. I bought the paperback copy as soon as it was out but if you can get your hands on the hardback that would be even more special. If reading this as a class novel you can find teacher notes here. 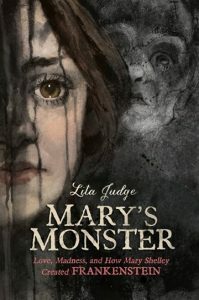 It would certainly make a good story for a read-aloud or a student bookclub. Loved it! 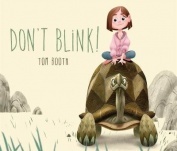 Don’t blink by Tom Booth @TallTomsTales : perfect feel-good fun picture book to challenge young readers. Just don’t blink! Some books you just fall in love with. This is one those books. Beautifully illustrated with a delightful young girl centre stage surrounded by a menagerie of equally delightful animal friends. They join together to play a blinking game almost all of us have played at some stage in our lives. Not only do they challenge each other to stare as long as possible without blinking, but they challenge the reader to join in. It is a lovely picture book with a wonderful feel-good quality that makes me smile every time I read it. While it may be aimed at younger readers, adults reading this to children will also be drawn to its sweetness and challenges. Think you can win a staring contest against an elephant? What about a gorilla, a cheetah, a fox, or an alligator? What about all them―AND a bunch of their other animal friends―at the same time? You’re about to find out! There are some fun activities to download on the author/illustrator’s website too, including masks, and spot the difference pages. Love, love, love this book. Tintinnabula by Margo Lanagan and illustrated by Rovina Cai @margolanagan : beautiful sophisticated picture book where out of the darkness we find strength and hope. from violence and uncertainty to a still, sure place. The first thing you notice with this beautiful picture book is the cut out shape in the middle of the cover. It is a portal into another world. 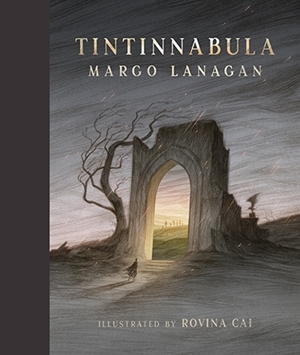 Margo Lanagan takes us on a journey through darkness and out the other side. A lone figure stands at the entrance, seemingly hesitant to walk through, but guided by the light in the distance on the other side, we know she will step inside. And we step inside her world too. She hears the sound of bells ringing far away and this urges her onward through dark inhospitable landscapes with hidden dangers lurking in the shadows. The language is succinct and sublime, poetical and poignant. What makes this particularly powerful is that as the young woman travels through harsh environments she discovers that the strength she searches for comes from within. Only she can save herself and move from the darkness into the light where she can finally find peace. The illustrations are beautiful. Different shades of grey, black, and red merge to create a haunting and moody atmosphere, at times quite chilling. There are dark shadowy creatures chasing the young woman but she keeps going, following the sound of bells. Splashes of white soon begin to appear, blending and forming into the shape of bells. Symbolically they lead her to self-acceptance. As dark as this sophisticated picture book is, it is in the end an uplifting one. It is within ourselves that we find strength to move forward when life becomes too difficult. A stunning book, dark, broody but also hopeful. This is a wonderful sophisticated picture book that can be read across all levels.